Captivate attention by lighting up your message! Easy to write-on/wipe-off board gives you the freedom to create your own custom message in a unique and eye-catching manner. 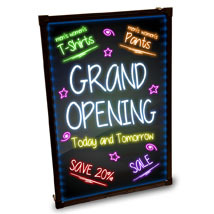 LED edge-lighting gives consistent light across the entire panel to turns your messages into a vibrant, colorful sign. This strip of lighting can be found along the edges of the display, and illuminates your written messages. Edge-lit LED light in either red, blue or green, choose from many different lighting settings like flash, fade or constant on. Can be wall-mounted or suspended vertically or horizontally. Includes hanging chain, remote control, cleaning towel and 8 fluorescent markers. Extra marker set is available for purchase, see item# 4673.